SUMMARY: Tositumomab and iodine I 131 tositumomab (Bexaar) therapeutic regimen targets monoclonal antibodies against the CD20 antigen expressed in non-Hodgkin lymphoma. This article reviews the mechanism of action and clinical indications for this regimen. Tositumomab is a US Food and Drug Administration−approved murine immunoglobulin G2a λ monoclonal antibody directed against the CD20 antigen, which is a transmembrane phosphoprotein expressed on pre-B-lymphocytes and mature B-lymphocytes.1–3 The CD20 antigen is also expressed on >90% of B-cell non-Hodgkin lymphomas. The Bexaar therapeutic regimen (tositumomab and iodine I 131 tositumomab) is an antineoplastic radioimmunotherapeutic monoclonal antibody−based regimen composed of the monoclonal antibody, tositumomab, and the radio-labeled monoclonal antibody, iodine I 131 tositumomab.4–6 Once bound to the target cells, Bexxar delivers radiation, which enhances the killing effect of the antibody. Normal B-cells will recover in 6–9 months because the parent B-cells do not have the CD20 receptor. Multiple mechanisms of action have been proposed for tumor killing by the Bexaar regimen,4–8 which include the following: 1) apoptosis, 2) complement-dependent cytotoxicity, 3) antibody-dependent cellular cytotoxicity, and 4) ionizing radiation from the radioisotope. In addition, a potential vaccine-like effect leading to adaptive immunity against cells that survive initial treatment is also suggested. 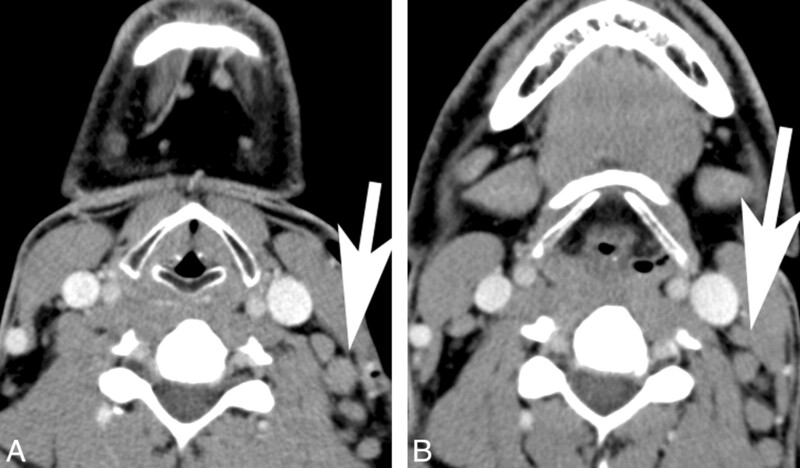 Contrast-enhanced CT scans at the level of the cricoid cartilage (A) and hyoid bone (B) in a 56-year-old male patient with rituximab-refractory non-Hodgkins lymphoma demonstrate enlarged level III/IV and level II lymph nodes (arrows). A and B, Subsequent to Bexaar therapeutic regimen, the follow-up contrast-enhanced CT images show significant reduction in the size of these lymph nodes (arrows). To our knowledge, the safety of multiple courses of the Bexaar therapeutic regimen or a combination of this regimen with other forms of irradiation or chemotherapy has not been evaluated. The Bexaar therapeutic regimen is administered in 2 discrete steps: the dosimetric and therapeutic steps.9,12,13 The dosimetric step involves only an infusion of tositumomab. The therapeutic step is performed 7–14 days later, involving administration of an infusion of tositumomab followed by an additional smaller dose of tositumomab that is attached to the radioactive isotope iodine 131. This step delivers approximately 75 cGy of radiation to the body. The most serious adverse reactions observed have been severe and prolonged cytopenias and the sequelae of cytopenias, which included infections (sepsis) and hemorrhage in patients with thrombocytopenia, allergic reactions (bronchospasm and angioedema), secondary leukemia, and myelodysplasia.9,12,13 Less common but severe adverse reactions are pneumonia, pleural effusion, and dehydration. The Bexaar therapeutic regimen is expensive and may cost approximately $25,000 per patient. The regimen is covered under Medicare. Disclosures: Suresh K. Mukherji, Consultant: Philips Healthcare. Accepted after revision February 12, 2011.